The Company subject of this case study is a multinational company operating in the biotech industry. The plan of investment foresees a new laboratory dedicated to tissue engineering for commercial purposes in accordance with the GMP standard. The intention to build a state of the art facility brought the Company to investigate the adoption of Isolation Technology to guarantee complete continuity of a Grade A environment and to assure an improved quality of the final product together with full compliance with GMP and FDA regulations. The challenge was to develop custom laboratory equipment as well as specific solutions to ensure asepsis while maintaining ease of use and operability. Human tissue regeneration is in wide expansion and the fields of application are getting broader day by day. Some of them are already well established in manufacturing processes so the aspects related to commercial use are mostly connected to upscaling from laboratory, regulatory compliancy, overall profitability in terms of capital cost, and operational costs. 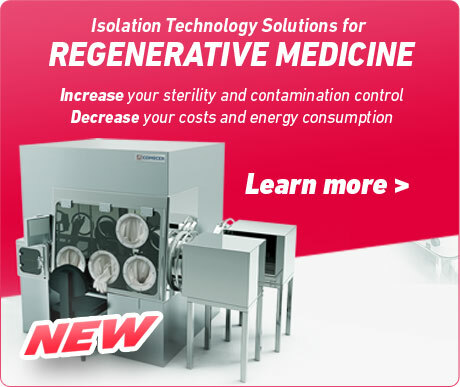 The challenges represented by the need for high levels of sterility and for the elimination of all cross contamination within Regenerative Medicine (see White Paper “Sterility and Cross Contamination Challenges in Tissue Engineering and Regenerative Medicine”) are pushing toward the adoption of isolation technology instead of traditional clean rooms since the advantages demonstrated in aseptic processing for the pharmaceutical industry are evident. Primary cells can reach the laboratory in different conditions and packaging, while all other consumables such as pipettes, media, flasks, bags, FBS, trypan blue, trypsin, etc have containers that are already in use by the Company. The need to have an inlet and an outlet for consumables, for primary cells, for the exit of the final product, and for the handling of waste and tools was given as a must by the Company. The initial sketch was created with in mind both general aseptic processing used in Isolation Technology (formulation, sterility testing and sterile fill finishing) and Equipment integration solutions in API processing. The idea to segregate the technical unclassified area from the operator side was taken from a concept developed in sterile vial filling called “balcony design”. The advantages given in terms of operation and maintenance of the isolators and of the integrated equipment is well recognized by the pharmaceutical industry. On the market there were no incubators, refrigerators and centrifuges that could be integrated in isolators in the way we meant to be. To allow the internal volumes of centrifuge, incubator and refrigerator to be continuous with the Grade A (FDA – Class 100) isolator enclosure. This meant to be subject to Vapor Phase Hydrogen Peroxide decontamination cycles to reach a 6log reduction on bacteria spores, as well as to be an integral part of the enclosure in terms of air tightness. In addition, stainless steel 316L with mirror grade finishing needed to be assured in all the internal volume components where technically feasible. Transfer hatch: connected to the separation module to be used as an entry and exit port. Laminar Airflow equipped with HEPA H14 filter: in aseptic processing, extensive manual operations through gloves can be a major source of particulate, that is why laminar airflow (which means higher volume changes in the enclosure) is preferred since it assures a better “air wash” of the working area. A mockup was carried out to ensure ergonomic correctness, mainly in the incubation modules since operators were going to work while sitting for prolonged periods. Accessibility to all integrated equipment was also assessed. H2O2 gas was state of the art for the requested performance. Different cycles for the full isolator and equipment, one rapid cycle dedicated to the transfer hatch, decontamination performance achievement to be verified also in internal incubator and refrigerator volumes as well as in the centrifuge bucket. 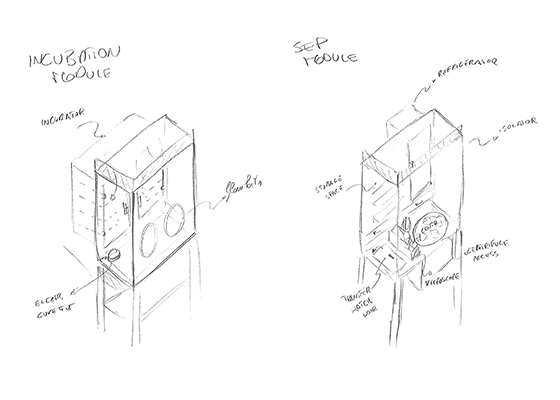 The configuration of each isolator unit is composed of one separation module with two incubation modules on the side, with a transfer hatch that is placed on the bottom of the separation module to serve all three modules. The integration solutions are represented in the pictures below. Incubator access doors: the entire volume of 400 liters is accessible from the interior of the isolator through 8 small doors. Each one of them permits to access two extractable trays. Refrigerator: 80 liter capacity are accessible from the interior of the isolator chamber through a single door. The internal volume then is equipped with sliding trays. Storage area: a storage volume has been defined for media and other process material. The microscope has been equipped with a digital camera connected to an external monitor, the electroporation cuvette has been placed within the chamber, while the control box is outside. The final layout of the Manufacturing Suite has foreseen a laboratory side classified as Grade D according to the GMP while the technical side in the back of the isolators (needed for maintenance access) is unclassified. As a result, the specific integration solutions developed within this project are leading to their implementation in other Regenerative Medicine fields such as Cell Therapy, Stem Cell Manipulation and Tissue Engineering .